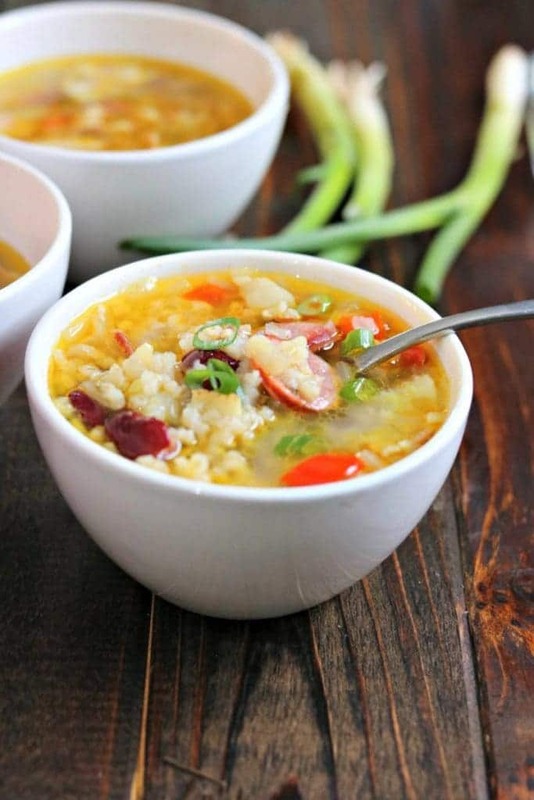 A deliciously spiced, filling soup, packed with bacon, andouille sausage and rice – this Cajun Style Red Bean & Rice Soup is a stick-to-your-ribs soon-to-be favorite! Phoenix is so unusually cold this year that at work, our DC office is holding a very tongue-in-cheek (they deny this) COAT DRIVE for those of us freezing in Arizona. Very funny, DC, very funny. With the cold comes a major need for warming soups, stews and other stick to your ribs fare. I struggle with making stews during the week, but this soup is PERFECT for a weeknight. Can be done in less than 30 minutes. AND it’s delicious. I actually packed an entire QUART of it for my lunch – because, I will probably have to share when I heat it up in the kitchen at work. Cajun Food – what IS that?! I’m not going to pretend I’m an expert at all – but as I understand it, Cajun food is very well seasoned, a bit spicy for some, and usually involves garlic. I typically make soups with onion, celery and carrots – but in Cajun cooking – the carrots are replaced by red peppers. Oh! and they love green onions. Which is lucky, because so do I! I’m delighted to be working with Veetee Dine In Rice again. So is my husband! He loves everything I’ve ever made using the products, and honestly – so have I. I love the convenience of them – perfectly cooked rice every time. 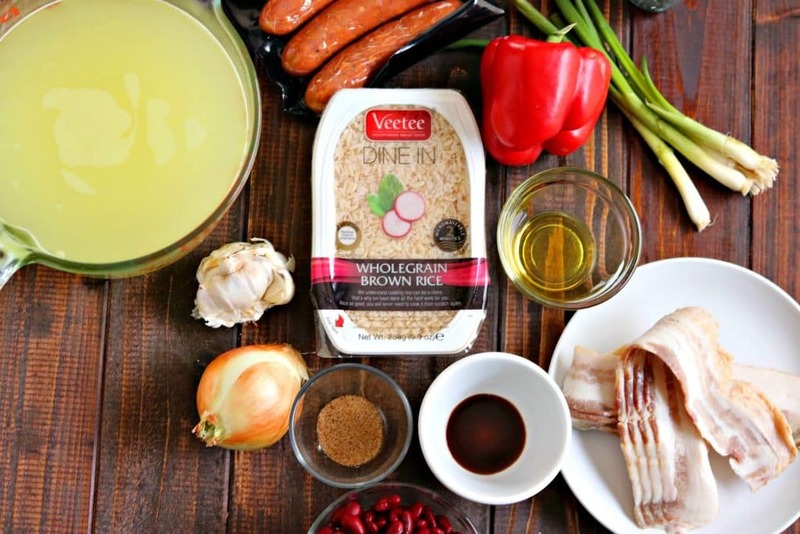 For this dish I used Whole Grain Brown rice – but you could use ANY of the plain Veetee varieties, and this would turn out great. I just like the texture of brown rice for this. This is GREAT to make ahead, and actually tastes better the next day. The recipe makes 3 quarts, and freezes very well. I’d love to hear how you beat the winter blues – leave me a comment and tell me what kind of food you eat when it’s this cold! Want more soup? Of course you do! 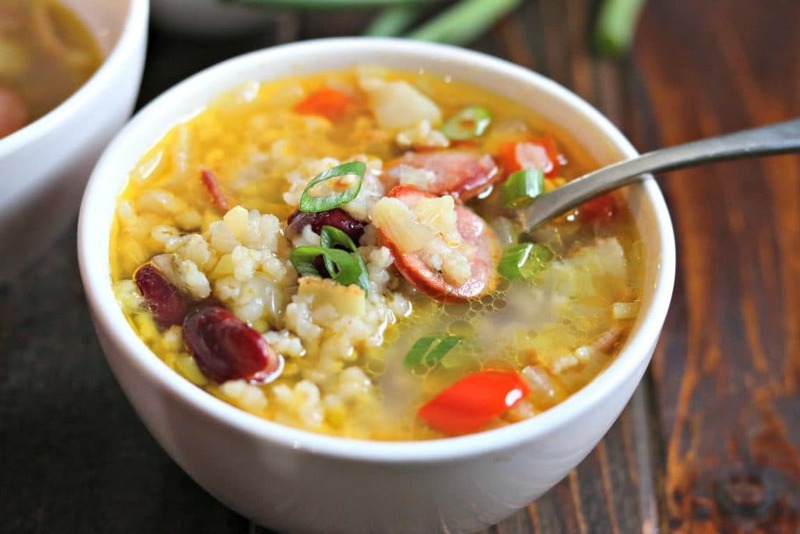 A deliciously spiced, filling soup, packed with bacon, andouille sausage and rice - this Cajun Style Red Bean & Rice Soup is a stick-to-your-ribs soon-to-be favorite! In a large dutch oven or saucepan, heat the oil over medium heat. Add the bacon and cook until it begins to brown. Add the onions, garlic, peppers and sliced andouille and cook for 2 minutes. Add the beans, stock, Worcestershire sauce, Cajun seasoning and bay leaves. Bring to a boil, reduce heat to low and simmer for 10mins, stirring occasionally. Add the rice and half the sliced green onions, and simmer 5 more minutes (the rice will thicken the soup). Test for seasoning – adjust if necessary. Ladle soup into bowls, garnish with green onions. I’m such a fan of Cajun food! Love the spices, the Andouille, the use of shrimp! I love a meal that comes together in 20 minutes and this soup is right up my alley!! Love the bold flavors of Cajun cuisine. What a great recipe, definitely perfect for the cold weather!!! This would definitely be great to keep me warm, it’s so cold out! I love soups especially this time of year. I’ve never really made much cajun style food but it sounds like something I would like. I never really think of using rice in soup but I think it could be a great addition. Since it’s Mardi Gras this is perfect timing for this recipe! I love anything creole or cajun and especially anything with andouille sausage! Can’t wait to try this recipe! Thanks for sharing! I love red beans and rice! What a yummy idea for a soup.. I love how quick this comes together! Soup sounds amazing right now- It’s so cold out! Definitely lots of soup, stew, and crock pot happening at my house in the winter. This soup is exactly the kind of thing I crave after coming in from the cold at the end of the day! Spices can be comforting and warming too! This looks like it would make a wonderful lunch on a cold winter day! I also love that you can freeze it! Girl, you know how much this guy loves a good winter soup or stew! I’m so in love with this dish. All of the ingredients are super familiar – and I love green onions too – with the exception of the sausage. Have I ever heard of andouille sausage? I’m not sure I have, but after a quick google search, it’s now on my list of things to try! Homemade soup is the best. We love using sausage in soups….it adds so much flavour. This sounds like the perfect comfort food for these cold winter days. It would make great leftovers too. This Cajun-style red bean rice is comfort food in my book! I love anything spicy – something that will create a flavor explosion in my mouth. Looking at all the ingredients, I can be certain this soup will do just that! YUM! My dad makes red beans and rice and it’s more like a stew. I’m loving this version that would be more of a slurping soup. It looks so hearty and comforting! I can’t wait to make it! Love this soup because it is ready in 20 minutes also with protein and carbs in one bowl. Cajun cuisine is my weakness. I am rice lover need to try this soup. I love making soups and these kind are my favorite as you can finish the meal with one bowl. Love the Cajun style recipes and we use a lot of rice in our Indian cooking. This recipe will be liked by everyone in my family! This sounds delicious! I think the spices in here are perfect, and would be such a great way to warm up in this cold weather! I love red beans and rice, but I’ve never considered turning it into a soup. 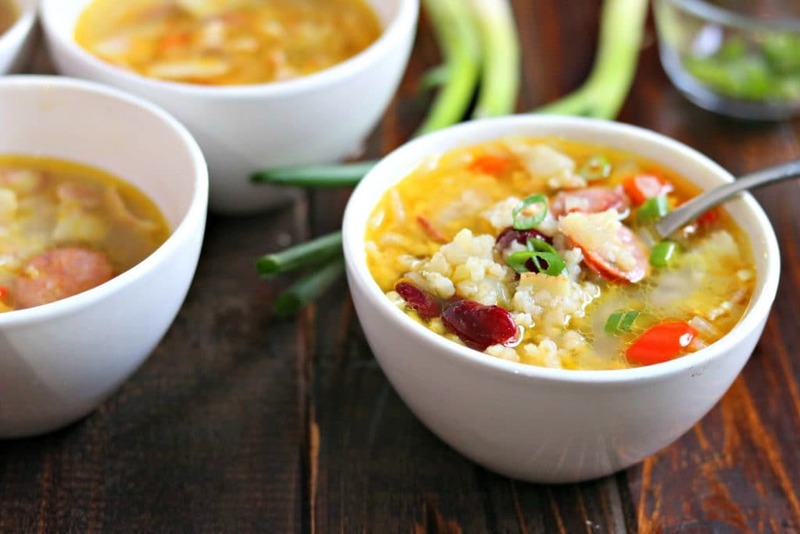 It has such great flavor so it’s the perfect soup conversion – not bland and boring! I picked up a cold this weekend and have been craving soup ever since. Definitely going to give this one a try since it looks filling but won’t be too hard on my stomach! I love this recipe. Cajun food is so amazing, and to turn the traditional red beans and rice into a soup for this cold winter is a great idea! When I make dishes like this, I like to add a little gumbo file, as it adds a unique flavor and also acts as a thickener. I also like to add a touch of fish sauce (I know, it sounds weird, but it works) to intensify the flavors. Thanks for the great recipe! I sometimes add chicken and. Shrimp to it. It is a good soup. I like Minestrone, Bacon Bean, Chicken Noodle, Beef Stew, Chili, Clam Chowder and other soups. I am a soup fan all year round. Biscuits,corn bread,crackers are my breads. If the bread is good, I like it with my soup. Thanks for joining us on G+.